Come and join with us at the Mount Waverley Community Centre and experience first hand the wonders of these amazing plants. Every year ANOS Victoria holds its orchid show on the last weekend in September. You will see the most diverse and largest collection of Australian terrestrial orchids including rare and endangered species. Learn about the advanced techniques developed by our members who are acknowledged as leading the world in the conservation of terrestrial orchids. 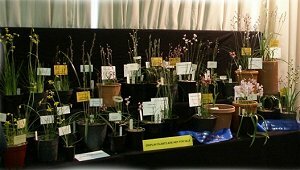 We have an enviable depth of knowledge on all Australian native orchids and our members will be on hand to answer your questions. An extensive range of plants will be on sale from seedling to specimen size plants and all are reasonably priced. If botanical art or photography is your interest there is a section devoted to this pursuit and again works will be for sale.